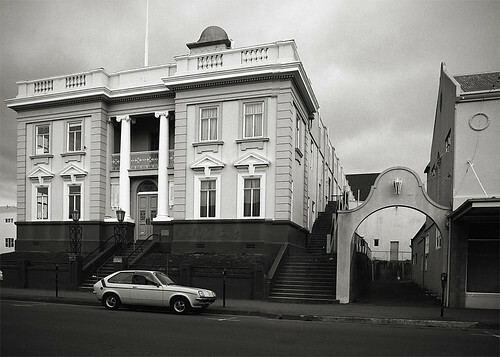 In September 1987 Tauranga saw protests about the demolition of its Town Hall. The protests included an occupation by tangata whenua from 14 September 1987 until they were evicted on 16 September 1987. Demolition of the Town Hall was completed by early October 1987. September 2017 will see the 30 year anniversary of the occupation. Researched and written by Debbie McCauley. The land was purchased from Maori by Alfred Brown for the Church Missionary Society (CMS). The first purchase took place on 30 September 1838, the second on 30 March 1839. It was understood that the land would be retained under solemn trust and used for the benefit of nga iwi o Tauranga Moana and the Church. In 1864 the first building was constructed on the later site of the Tauranga Town Hall on the corner of Wharf and Willow Streets. Henry Tacey Clarke, Civil Commissioner of Tauranga, had his home built by Frederick George. Clarke's home was known as the house on ‘the hill’. After much pressure and with protests from Archdeacon Alfred Brown, most of the land purchase was given to the Crown by CMS on 7 September 1867 following the Battles of Gate Pa and Te Ranga in 1864. Clarke occupied his home until 1875. The site was vested in the Borough of Tauranga in 1885. A Tauranga County Council clerk, John Hollings Griffiths, moved into Clarke's house in 1890. He was still there when the house was shifted along from its original site. This was to allow 3.6 metres of soil (‘the hill’) to be removed and used as fill for the railway line running along the Tauranga wharf front. This also served to flatten the section. After much controversy about the site of the Tauranga Town Hall a design competition was held and proposals lodged by the beginning of March 1914. Tauranga architect Conrad John Kirk won the design contract for the hall with his renaissance style plans for a two storey concrete construction. The builders were Ashton and Crump. A substantial hillock had to be removed in order to create a platform for the Town Hall to stand on. Tenders were called in October 1914, and work began on 19 November 1914. Workmen objected to being told what to do by Mr Jorgensen, a foreign overseer from Denmark, which held up building work. On 10 December 1914 the foundation stone was laid, underneath which was placed a time capsule containing coins, postage stamps and issues of the Bay of Plenty Times. Bad weather and debates about gas or electric lighting held up building work. According to the Bay of Plenty Times (29 June 1915, p 4), the instructions for seven leadlight windows were received on 16 February 1915 and the materials were ordered the same day, but they didn’t arrive until the 16th and 27th of April. In January 1916 the council occupied part of the building with the first public event being a reception of Lord and Lady Liverpool on 12 February. The first picture show in the Town Hall was on 19 April 1916 with Mayor Macmillan making a speech. The first Anzac Day service was held on 25 April 1916 during which a Roll of Honour was unveiled at the entrance to the municipal chambers. It listed seven soldiers from Tauranga who had fallen in battle up to that date. The Griffiths family moved out of their home next to the Town Hall in 1918 and the building was dismantled. The pieces were purchased by William Robin in 1920 and re-erected in Judea. On 24 September 1930 the Bay of Plenty Times reported that a retaining wall was to be erected on the Town Hall section. The Tauranga Town Hall with its Edwardian architecture was a building beloved by many. The 72-year-old building was constructed in 1915-1916. When it was earmarked for demolition several groups formed to try and save it. One of those groups of Ngai Tamarawaho who asserted that the land had been illegally confiscated after the Battles of Gate Pa and Te Ranga in 1864. In 1987 the Tauranga City Council decided to remove the building and replace it was a civic complex which would include a new library. Citizens held protest meetings, discussions and demonstrations. By 8 May 1987 Dr Neil McKenzie had collected nearly 2000 signatures to save the Town Hall from demolition. On 8 June 1987 The Ritchie Pickett Band, Dr Jazz and Beasley Street played a concert in Spring Street Mall to protest the plans to demolish the Town Hall. Musician Ritchie Pickett wrote a song for the concert called, ‘The Song About The Town Hall Coming Down’. Dr Neil McKenzie (Dr Jazz) wore his ‘Save our Town Hall’ T-shirt at the concert. A protest march was held on 4 September 1987 through downtown Tauranga with around 150 banner-waving campaigners. They marched from Red Square up Devonport Road and down Grey Street led by four bagpipers. The group presented mayor Noel Pope with their 5000-signature petition at the council's Spring Street chambers. Complaints about the demolition were made to the Waitangi Tribunal, the Ombudsman, the Historic Places Trust and the Ministry of Conservation. Work started on packing up the Local History section of the Tauranga Library, and staff from the Tauranga District Museum started to identify items that could be salvaged. By 8 September Mayor Noel Pope and Council CEO Alan Bickers had actioned the disconnection of power and water supplies to the Town Hall and authorised council staff to start stripping fittings from the building. A dawn service was held by Ngai Tamarawaho on 14 September, after which the Town Hall was occupied. The protestors flew their flags from the building and painted slogans on the walls, also planting a pouwhenua staking the iwi's claim on the front lawn. The Council called upon the police to evict the protestors. Reinforcements were called in from Whakatane and Rotorua and on 16 September 1987 the police moved in. Debris including rocks and wood were thrown down the stairwell by protestors and onto the heads of police attempting to gain entry into the Town Hall. Police were then fitted with protective shields and helmets. They used sledgehammers and a chainsaw to smash through the barricades. Fifteen men and eight women were arrested and charged with trespass while press photographers and journalists were threatened with arrest and told to leave the premises by police. Once the protestors were evicted, demolition of the Town Hall began immediately. The building was reduced to rubble over three days from 22 to 24 September 1987. Rubble and excavated soil was dumped on a swampy area near Huria Marae. The filled in a swamp later became a sportsground. By early October the Town Hall site was cleared. Ngai Tamarawaho lodged an injunction seeking to halt redevelopment of the land until the Waitangi Tribunal had heard their claim. The injunction was heard at the Hamilton High Court. The Bay of Plenty Times reported the finding of the Town Hall Time Capsule on 2 October 1987. It was found underneath the foundation to the right of the main doors. The contents were handed to city archivist Jinty Rorke. The time capsule was made of glass and the broken pieces are on display in Research Collections at Tauranga City Library. When the capsule was recovered it was found to be lacking its gold sovereigns, although the other items of no commercial value were still in there. The Town Hall Dome was purchased by Janice Priest and installed at her home in Robins Road for use as a gazebo. Her house in Robins Road was built for Henry Tacey Clarke and originally stood on the Town Hall site. In 1989 designer and leadlighter Paula Dennison created a modern surround to complement two stained glass leadlight windows salvaged from the Tauranga Town Hall. This work can be found above the entrance to the Civic Arcade on Willow Street. On 15 October 1987 the Kaimai Trades Council placed a green ban on the Town Hall site in support of Maori wishes that nothing be done on the land until the Waitangi Tribunal dealt with ownership issues. The following year, on 27 October 1988, five men barricaded themselves into the new civic building after the High Court in Hamilton refused a restraining order preventing development of the site. At 7am a police sergeant tried to talk to the protestors, but had petrol thrown over him. Books and building materials were used by protestors to barricade themselves into the building. They blocked the stairwell and were covered in paint, glue and solvents. At approximately 9.15am police with helmets and armed with batons gained entry by smashing a small window. Paint was thrown at police. Two police dogs and their handlers were first inside the building. Protestors poured petrol down the stairwell onto the thousands of piled library books and then set it alight. A constable with his dog deflected a blow to his head with a length of timber. When police moved to make arrests petrol was thrown over the two police dogs which ignited from the already burning fire. The fire brigade doused the flames in the stairwell. One of the protestors was badly burned along with the police dogs. The protestors appeared in court on 16 November. Bay of Plenty Times (29 June 1915, p. 4). Town Hall Contract. Bay of Plenty Times (16 March 1916, p. 3). Municipal Enterprise: Town Hall Building. Bay of Plenty Times (24 September 1930). Local and General. Bickers, Alan (November 2015). Record of the Occupation of the Tauranga Town Hall & Public Library in 1987. Harris, Aroha (2004). Hikoi: Forty Years of Maori Protest (pp 100-101, see also Fiscal Envelope Protest p. 125). Historic Places - Town Hall (Research Collections Vertical File). O'Malley, Vincent (November 1996). The Te Papa Block: A History of Church Missionary Society and Crown Dealings, 1838-1867. Reece, Alistair (2005). Te Papa: CMS's Naboth's Vineyard? An examination of issued between the Church Missionary Society and Tangata Whenua of Tauranga Moana, 1839-1867. Riseborough, Hazel (1999). Ngai Tamarawaho: Protectors of the Prophecy (pp. 141-148). Rorke, Jinty (1993). Policing Two Peoples: A History of Police in the Bay of Plenty (pp. 176-179).